Yes, this is my cry for help – my friends: plan an intervention or something .. because I am addicted to Tresor and I can’t stop snacking it. 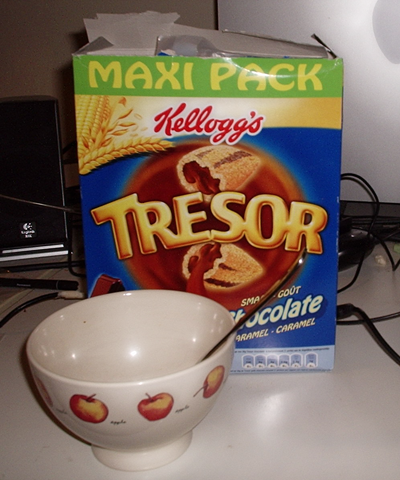 Kellogg’s Tresor Chocolate Caramel Maxi Pack cereal is just so awesome, .. It makes me feel like a child again, but I don’t care! I throw it in a bowl and add a bit of milk and stuff my face. [update: January 2016] I am pleased to announce that I am Tresor-free! It’s been a couple of years, but I did it. I have yet to find a healthy replacement though, tweet me some suggestions?